June 24th marks the day of the annual celebration of Florence’s Patron, San Giovanni. This public holiday in Florence is filled with a series of spectacular events throughout the day to honor the city’s heavenly protector. St. John the Baptist, to whom Florence’s baptistry is dedicated, is also the patron saint of Turin and Genoa where other celebrations occur on this very same day. The highlights of the day’s celebratory events consist of a historical parade in Renaissance costume, the final match of “the gladiators” of Florence competing in Calcio Storico and a finale of fireworks. 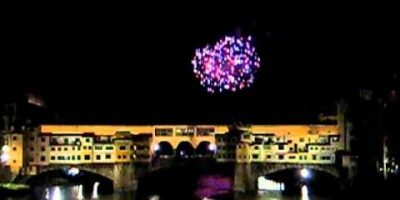 Here’s a video of the fuochi di San Giovanni or St. John’s fireworks.